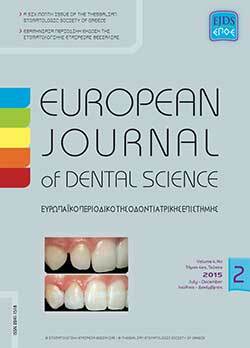 European Journal Of Dental Science is the official journal of the Stomato­logic Society of Thessaly and publishes original articles, review articles, reports of interesting clinical cases, clinical or laboratory studies, editorials, letters to the editor and any article related to Odontostomatology. Manuscripts may be written in English and should include a summary in Greek. Greek summaries of our foreign authors will be prepared by the edi­ torial board. Articles should be submitted through e­mail. Manuscripts must be typewritten with double spaced lines and there should be wide margins (about 2.5 cm). The first page of the manuscript should include the title of the article, full name(s) of the author(s), academic degrees, and institutional affiliations and positions. The second page should have only the title of the paper. The last page of the manuscript should include the corresponding author’s address, business and home telephone numbers, fax numbers, and e­mail address. Any article must include 1. Abstract of 150 words or less 2. Introduction in­ dicating the purpose of the study 3. Description of the methods and materials used 4. Results 5. Discussion 6. Conclusions and 7. References. A summary in English or Greek of 400 words or less must be provided at the end. References should be written in a separate page and in alphabetic order. References in the text should be quoted by the author’s name(s) and the year of publication. In the case of two authors both names should be stated. If there are more than two authors only the first author plus et al. is used. References to papers must be given as follows: Kau CH, Richmond S, Palomo JM, Hans MG. Three dimensional cone beam computerized tomography in orthodon­ tics. Journal of Orthodontics 2005; 32: 282­293. References to books must be given as follows: Moorrees C F A. The dentition of the growing child. Harvard University Press, Cambridge 1959. Illustrations: All illustrations including tables should be cited consecutively in the text. Figures should be saved as separate high­resolution image files without their captions (captions should be included with the text of the ar­ ticle). Minimum resolutions are 300 d.p.i. for colour or tone images, and 600 d.p.i. for line drawings. The preferred format is *.psd, *.tiff, *.jpeg, *.pdf, *.eps.. Font­related problems can be avoided by using standard fonts such as Times Roman and Helvetica. Wherever possible, figures should be submitted in their desired final size, to fit the width of a single column of text (76 mm) or a double column of text (160 mm), and to a maximum height of 160 mm, thereby allow­ ing space for the figure caption. Any lettering should be approximately 2 mm in height and should be in proportion to the overall dimensions of the figure. Photographs should be of sufficiently high quality with respect to detail, contrast and fineness of grain to withstand the inevitable loss of contrast and detail inherent in the printing process. Line drawings should have clear and sharp lines that are a minimum of 1 point in thickness. Shading used on line drawings should be clear and distinctive; shades of grey will not reproduce well and small patches of white on an otherwise black background are likely to be lost on reproduction. Symbols used in figures should be limited to standard open and closed symbols (circles, squares, triangles and diamonds). Symbols cannot be generated in the legend and should be described rather than indi­ cated by a symbol. Figures and legends should be intelligible without reading the text of the manuscript. Photographs of people must be accompanied by a written consent. Failure to do so will result in the blacking out of the eyes to avoid recognition. Please note that it is not sufficient to use microscope imag­es/slides at a different magnification and allege that they are different images. Proofs: Authors will receive a PDF file of the complete paper by email. In the interest of speed, corrections must be returned within 48 hours. No major changes are permissible at this stage and alterations should be restricted to correction of typographical errors. Please check text and figures very carefully. Corrections will be done at the expense of the authors. Copyright: Authors submitting manuscripts do so with the understanding that if their work is accepted for publication, copyright of the article, includ­ ing the right to reproduce the article in all forms and media, shall be assigned exclusively to European Journal Of Dental Science. No reasonable request by authors for permission to reproduce their contribution will be refused.